Authors: John Tobin et al. This explanation may suffice when explaining star formation to the public, but to an astronomer it is far too trivialized. Star formation is highly complicated due to all the physical processes involved – relying on magnetohydrodynamics, gravity, supersonic turbulence, radiative processes, and chemical processes, to name a few. Formation of multiple star systems adds even more complexities to the picture, and given that about half of all Sun-like are in binaries or multiples, the understanding of these intricacies is critical to understand star formation as a whole. Large-scale fragmentation of turbulent gas cores and filaments. Imagine we start with our “giant cloud of gas”. These clouds have internal motions that drive turbulence, and the turbulence drives shock waves that damp the internal motions of the cloud. When enough energy in the internal motions has been lost, gravity can take over and pull the gas together to form a dense core or filament within which stars can form. Smaller-scale fragmentation of a massive protostellar disk due to gravitational instability. We have our beginnings of a stellar disk that formed in one of the dense cores or filaments described above. In the center where the gas is densest we form protostars. Gravitational instabilities and smaller-scale fragmentation are thought to arise and form new stars when the self-gravity of the disk itself is significant compared to gravity of the central protostar(s). Turbulent fragmentation (case 1 above) has recently been observed by astronomers. However, as the fragmentation of the protostellar disk (case 2 above) requires high resolution observations within a short time window early in the formation history of the system, inferences from older systems constituted the only observational evidence of this mechanism, until now. Tobin et al. observed molecular gas and dust emission from a triple protostar system that sits a little over 700 lightyears away in the Milky Way named L1448 IRS3B, which from now on I will refer to as LIRS. LIRS was an excellent candidate to search for disk fragmentation, as it is likely less than 150,000 years old (a newborn baby in astronomical terms), and all three stars of the system are separated by less than 260 AU (about 6.5 times larger than the distance from the Sun to Pluto). 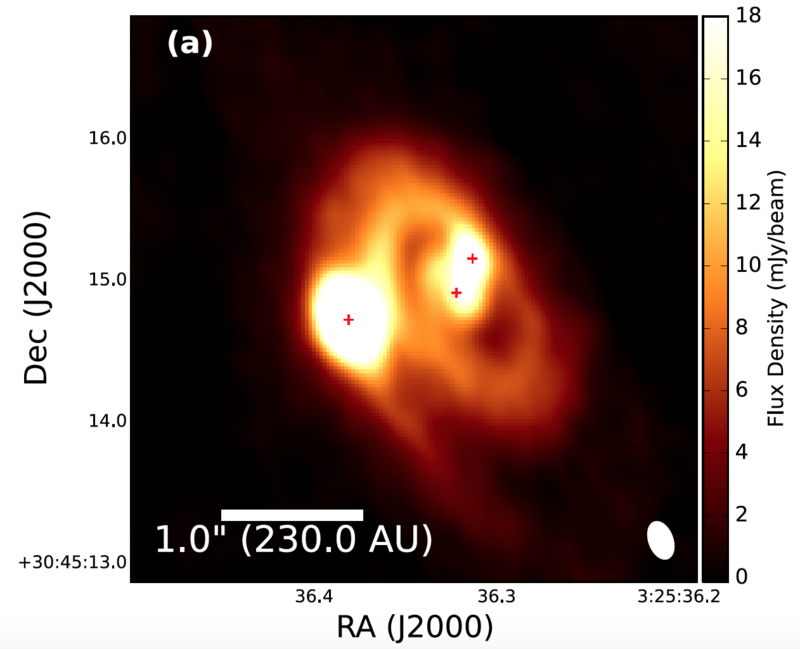 Figure 1: ALMA image of the disk and triple protostar system LIRS. The red plusses mark the locations of the protostars. The bright source on the left is the outer protostar associated with the higher emission from gas and dust, and the bright sources on right are associated with the inner protostars of the system. The white ellipse in the bottom right indicates the resolution. Adapted from Figure 1 of today’s paper. 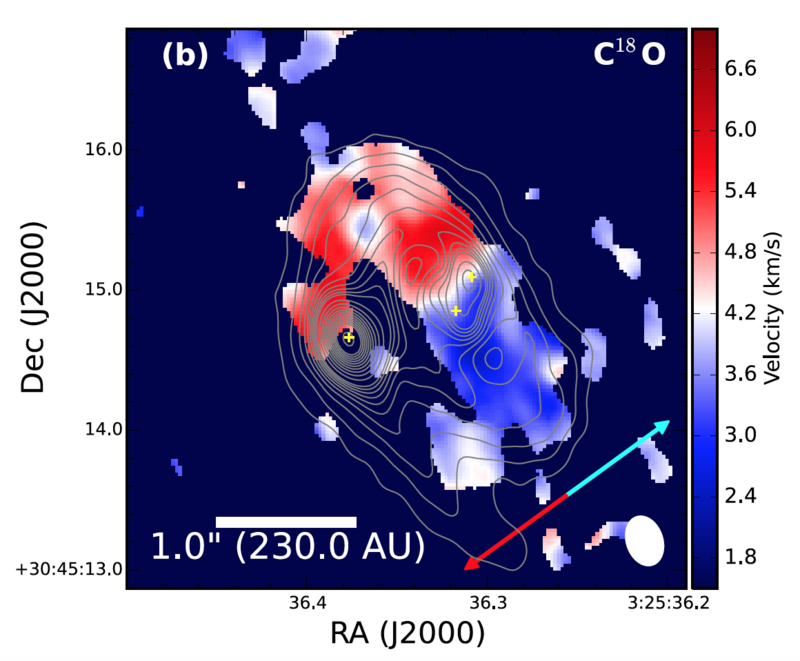 LIRS is still deeply enshrouded in an envelope of accreting material, and new observations conducted by ALMA provided 10x higher sensitivity and 2x higher resolution of the gas and dust emission from this cloud. The ALMA observations (Figure 1) indicate a disk with spiral structure, linking the two inner protostars with the outermost protostar. To add to this growing picture, by utilizing Doppler shifts of molecular line emission the authors were able to tell which parts of the cloud are moving towards and away from us, allowing them to identify the rotation of the cloud as a whole (remember, Doppler shifts can be thought of the apparent stretching or squeezing of waves when a source and/or detector are moving, making the wavelength of spectral lines look ‘redshifted’ when an object is moving away from us, and ‘blueshifted’ when an object is moving towards us). This velocity map (Figure 2) indicates that the two inner stellar components of the system make up the majority of the mass, despite the outer source being the brighter at the ALMA wavelengths. Figure 2: Molecular emission and velocity maps of the LIRS disk. Gray contours represent increasing brightness of ALMA observations at a wavelength of 1.3 mm. Yellow crosses indicate the location of the protostars. Redshifts and blueshifts are derived from a particular molecular emission line. The two inner protostars govern the rotation of the disk and thereby are near to the center of mass of the system. The white ellipse in the bottom right indicates the resolution. Adapted from Figure 2 of today’s paper. With these observational evidences at hand, the authors investigated whether LIRS hosts a gravitationally unstable disk that recently fragmented to form the outer component of the system. By totaling up the flux that ALMA received from the disk, the authors approximated the mass of the disk itself. Using the disk mass and other parameters of the system (such as the protostellar masses and orbital separations), analytical estimates were utilized to gauge whether LIBS likely succumbed to gravitational instability in the recent past. Both a canonical analytical estimate known as the Toomre Stability Criterion and a more detailed stability estimate derived by the authors pointed to gravitational instability in LIBS’s disk (feel free to peruse Methods Sections 6 of today’s paper for more details about these analytical stability estimates). The outer star likely formed from gravitational instability in the last few thousand years and is now acting to stabilize the disk. Furthermore, assuming the orbits of these three protostars are roughly Keplerian (i.e. elliptical), the orbits are dynamically unstable and will evolve on rapid timescales. This should cause the orbit of inner two protostars to tighten and the outer star to widen, forming a hierarchical structure that is common in older triple systems that have been observed. The observations and results of today’s paper tell us that protostellar disks can experience gravitational instability at young ages, and this process can lead to the formation of hierarchical multiple systems like those we observe in the Milky Way. Now, we have direct observational support of the two dominant theoretical models for multiple star formation.